It poured in Bangkok today. Thunder, lightning and buckets of rain. But the rain didn’t dampen the enthusiasm of the crowd of Red Shirt protestors at Ratchaprasong intersection. They were determined to have a good time and they did. While the Red Shirts were dancing in the rain, their leadership was mulling over an offer from the Thai Prime Minister of a “Road Map for Reconciliation.” The PM offered to dissolve parliament early (he didn’t specify how early) launch human rights investigations of the political violence since April 10 and hold national elections in mid November. Based on a November election date, most observers think that means the parliament would be dissolved in September. This doesn’t meet the Reds’ demand for an immediate dissolution of parliament but it is a huge compromise on the PM’s part, since elections are currently scheduled to be held in about 18 months. After some discussion in the Red Shirt camp, the Reds’ leadership announced that they will “conditionally” accept the PM’s Road Map. They want more specifics, especially a specific date for the dissolution of parliament, and amnesty for any criminal acts that may have been committed since the protests started around March 12. They said that in the meantime their barricades would stay up and the protests would continue. These are the most promising developments since I got to Bangkok on March 22. No one is saying it’s over, but a lot of people think the end is in sight. 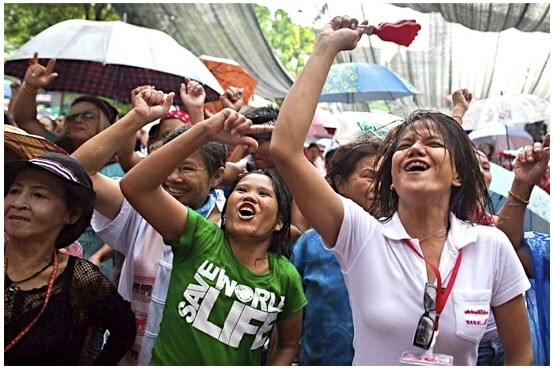 There are more photos of the Red Shirts rally in the rain in my PhotoShelter archive and available from ZUMA Press.